The Magnum will take down a fully shielded player, from start to finish, almost twice as quickly as the DMR will. Bungie have noted there’s some big caveats. The Magnum gets 'squirrely' if you go all out and squeeze off rounds as fast as you possibly can. Real squirrely. Second, the Magnum’s maximum effectiveness is found at short to mid range, fitting snugly between the Assault Rifle and the DMR. And while the DMR may take some extra time to take down a player, at mid to long range, it’s easily the more effective weapon due to its magnified scope and reduced recoil. How many shots to take down a Spartan? Pepper your enemies with bullets at mid range. Bungie have said that "ultimately the choice between the Assault Rifle and the Magnum may come down to personal preference, play style, and the situation you happen to find yourself in." The Grenade Launcher, or “Pro Pipe” is also a weapon you’ll want to spend some quality time with. If you point and shoot with a single pull of the trigger, you’ll send an explosive round out into the world. If it hits your target dead on, it will explode. If it bounces, it’ll arm much like a frag and explode after a short spell. It sounds like the player will be able to use this weapon quite tactically compared to say the old Brute Shot. 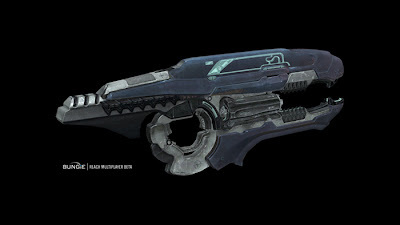 The Sniper is perhaps the all time classic Halo weapon if you think of it in terms of spreading across the entire Halo series of games (the Magnum was only awesome in CE). Technically speaking, the SRS99 (more formally Special Applications Rifle, Caliber 14.5 mm, SRS99) is a gas-operated rifle firing 14.5x114mm ammunition. The SRS first entered service with the Army in 2460, because of its modularity and ongoing manufacturer support the SRS99 was adopted by all branches in 2521. Probably this rifle's name is going to be the but of many pun based jokes. The focus rifle takes the Sentinel Beam and the old school Beam Rifle and combines the two weapon’s traits for some deliciously deadly peanut butter and chocolate type death dealing action. On other words, pain. Here we have the plasma repeater. I repeat, it's a plasma gun. 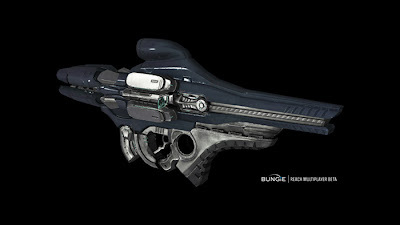 The Repeater is, essentially, the Assault Rifle’s counterpart, but it’s a little too effective for use in campaign. So when you’re in that space, you’ll likely see Elites utilizing the Plasma Rifle you’re already familiar with. The Plasma Launcher weapon can send a volley of one to four plasma explosives toward your opponent, depending on how long you keep your finger on the trigger. How many rounds you’re prepping is communicated to you through a nifty combination of visual and audio cues. And when you see and hear it coming your way, you need to find some cover. Pronto. The rounds will track both infantry and vehicles, but don’t freak out, the magnetism is more akin to the Needler than it is the Missile Pod. Vehicles are much easier to hit, given their size, but if you play it right, you can affix an explosive round to some poor sucker’s face. It's the new sticky bomb! 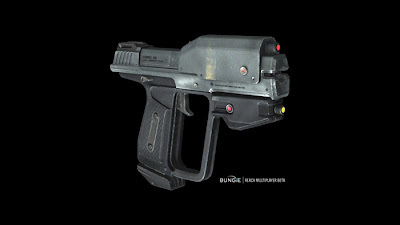 A classic halo weapon - The Type 25 Pistol (or T25 DEP) is more commonly identified as the Plasma Pistol. This small directed energy weapon has two modes of fire: semi-automatic direct and semi-guided AOE. The secondary AOE mode drastically reduces battery life. It's important to note the descriptions of these weapons and their operation is based on how Bungie has geared them to work in the forth coming beta test - and as such a liable to be changed by shipping date. The campaign for Reach is going to be great, however what got my attention was the online multiplayer. I like how they incorporated the finishing move/assassination into the game-play; it really makes you feel like your in control. The weapons are outstanding and if you haven't played the beta yet it's sick! I think that the armor abilities are great, but somebody will probably complain about it... You cant please everyone, but all in all this will be an amazing gaming experience. Another Job well done, thank you Bungie.